Many modern computers come with built-in speakers, but if you want high-quality sound, you’ll need a pair of external speakers. 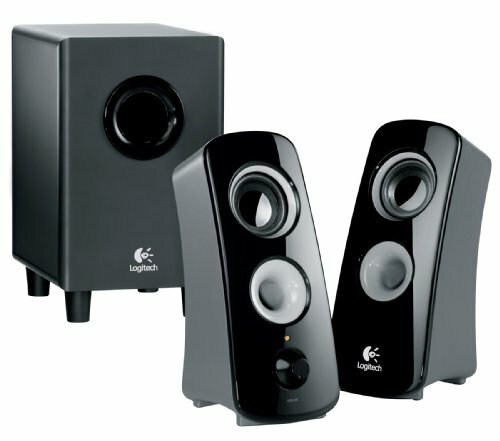 A set of the best computer speakers under $50 can deliver stereo sound and make every computing experience much more enjoyable. Some of the best speakers are ideal for gaming, music and movies, and you’ll have no trouble finding great computer speakers under $50. Before you decide on a particular product, you must know what to look for. An important feature to consider is the speaker enclosure because it helps determine the quality of the sound. A large enclosure will provide better low frequencies than a small enclosure, and if you want maximum bass, consider getting a ported enclosure. The material is also important, and you’ll get the best results from wood. 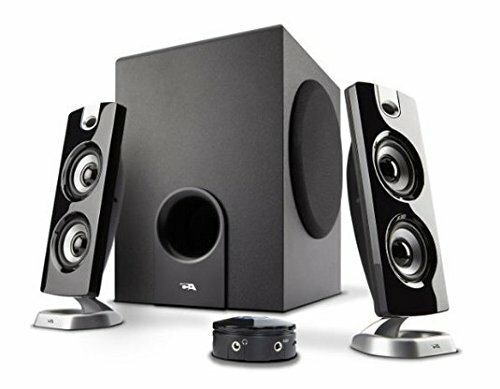 When shopping for computer speakers, you can choose between 2.1 and surround sound systems. If the speakers are labeled as a 2.1 set, the system will have two speakers and a subwoofer. A surround sound system will have up to seven speakers, but it’s unlikely that you’ll find a high-quality surround sound system for under $50. When shopping for computer speakers, it’s very important to check the wattage because it has a major impact on the overall quality of the sound. In most cases, a higher wattage equates to better sound, and you should know that peak power is the highest wattage the speakers are capable of. Below, you’ll find reviews for 10 of the top computer speakers under $50. The Cyber Acoustics 2.1 CA-3090 speakers feature a flat panel design and come with a subwoofer. They can produce a maximum of 18 watts peak power, and the RMS rating is nine watts. To produce high-quality sound, these speakers are designed with two-inch satellite drivers, and they have a four-inch poly carbon subwoofer, which fires sound out from the side. For convenience, these speakers come with a simple desktop control pod, and it allows you to adjust the volume and turn the power on or off. The subwoofer has its own volume control, and despite the cheap price, it’s capable of producing some decent low frequencies. 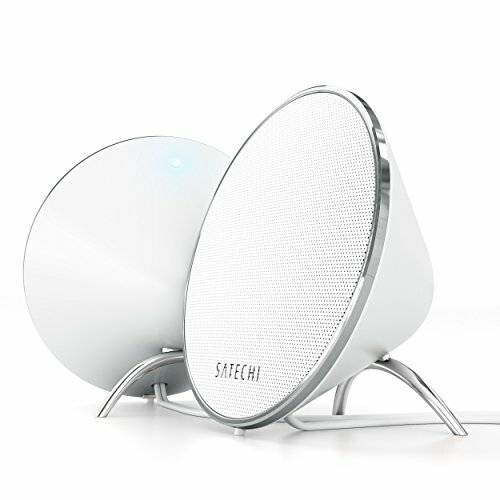 The smaller satellite speakers deliver great highs and work together with the subwoofer to produce enjoyable sound. Since this is a 2.1 system, it comes with two satellite speakers and a subwoofer, and the control pod is designed for functionality and style. 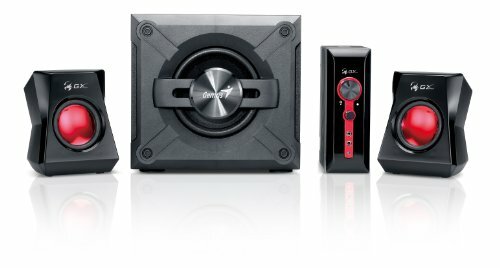 If you’re looking for a powerful, compact speaker system for your computer, this product is worth considering. Here we have another affordable set of speakers, and the Logitech Z313 speaker system comes with a convenient control pod. It allows you to quickly control the volume, and with a power rating of 25 watts, this system can send sound throughout a large room. Since this system comes with a compact subwoofer, it fits easily into tight spaces, and when you want to feel the music, the subwoofer delivers deep bass. The entire system is easy to set up, and once you’ve plugged the speakers into your computer, you’re ready to enjoy audio from your favorite movies, music and games. This speaker system is made with an AUX jack, which allows you to plug in a pair of headphones. Despite the affordable price, this speaker system doesn’t produce tinny, dull sound, and with 25 watts of RMS power, each component delivers balanced, rich sound. This is another product from Cyber Acoustics, and the CA-3602 FFP speaker system offers 62 watts of peak power. The RMS power rating is 30 watts, which is still enough power for rich sound. Like other products from Cyber Acoustics, this speaker system comes with three components, and one of the components is a 5.25-inch subwoofer. It also comes with a pair of two-inch satellite speakers, and the subwoofer fires sound out from the side of the enclosure. For optimal sound, the subwoofer is acoustically tuned and installed inside of a wood cabinet. The different components of this system can be controlled with the included control pod, and there is even an AUX input jack for headphones. Unlike some of the other affordable speaker systems from Cyber Acoustics, the CA-3602 FFP offers more wattage per speaker, and the subwoofer is slightly bigger than what you’d get from the CA-3090 model. 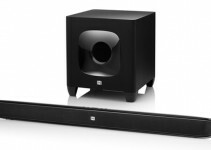 The ELEGIANT sound bar is a popular choice for computers, and it uses two small speakers to produce sound for games, music and movies. It features a low-profile design, and it can match the style of most computer monitors. This speaker extracts power from your computer’s USB port, and it even comes with a convenient headphone jack. You can use this sound bar to play audio from your computer while never having to waste desk space. Since it plugs into a USB port, it doesn’t require batteries or use a power cord. 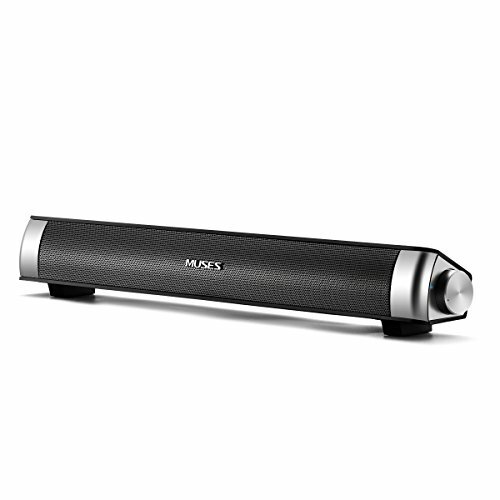 The ELEGIANT sound bar doesn’t come with software and takes seconds to set up. A large knob makes it easy to adjust the volume, and with full magnetic shielding, you don’t have to worry about the speakers ruining your monitor. 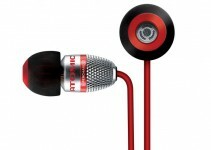 If you’re looking for decent sound and don’t want to pay too much money for it, this product is worth considering. Here we have another popular product from Logitech, and the Z323 speaker system uses 360-degree sound to immerse you in your favorite music, games and movies. The sound from these speakers is crystal clear, and it’s designed to fill your entire room. Since this is a 2.1 system, it comes with a pair of satellite speakers and subwoofer. For maximum low frequencies, the ported subwoofer fires sound down into the floor, and it allows you to feel the beat. 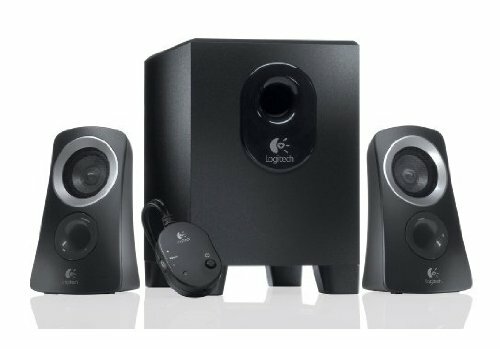 This speaker system has 3.5mm and RCA inputs, which makes it easy to connect the Logitech Z323 speaker system to your computer, iPod, DVD player or gaming console. For private listening, there is an integrated headphone jack, and with 30 watts of RMS power, you get high-quality, full-range sound. This speaker system is one of the most-innovative products created for audio, and since it’s a 2.1 system, you get a total of three speakers. The subwoofer component is designed for the lowest frequencies, and the two satellite speakers produce crisp highs. This speaker system is designed for all types of computers, and with a subwoofer that fires sound from the side, you’ll feel every beat. 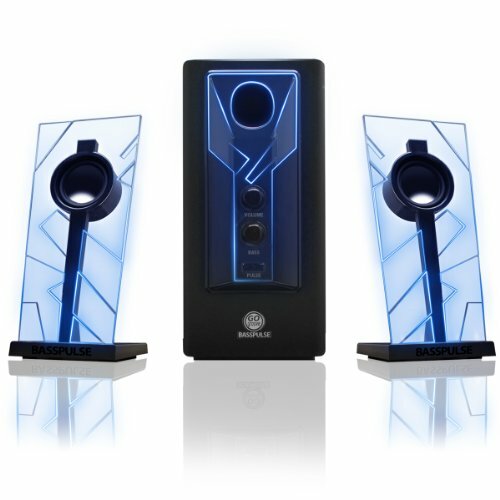 These speakers are designed to display blue accent lights, and the lighting pulses to the music. There is a convenient knob in the front of the system, which allows for quick volume adjustments. Each satellite speaker is powered by five watts of power, and the subwoofer uses 10. 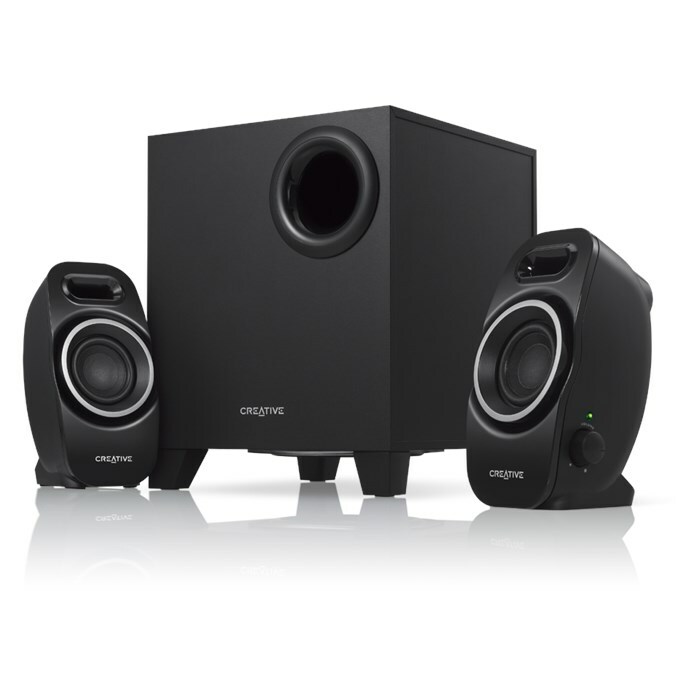 The Creative A250 2.1 speaker system is designed for high-quality sound and superior durability. With 2.1 channels, it produces sound from a subwoofer and two satellite speakers. 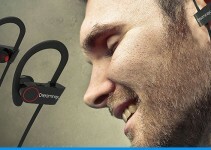 This product is Energy Star certified and uses special porting for enhanced sound. The Creative A250 speaker system features an improved image focusing plate, which enhances imaging and sonic directivity. The compact design of this system allows you to place it anywhere, and the speakers are tuned for optimal sound. Although this is a very affordable speaker system, the sound quality isn’t compromised, and the combination of speaker components deliver an enjoyable bass response and loudness. 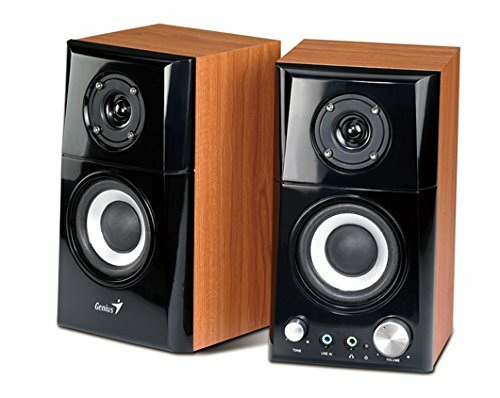 The Satechi ST-WDS20 speakers are ideal for a Mac or laptop, but they’re equally enjoyable when used with a standard PC. The Satechi ST-WDS20 dual speakers feature a sleek, rubberized matte finish, and they produce crystal-clear stereo sound. Since they’re powered by a USB port and use an inline volume control, there are no batteries to change, and you don’t have to fumble around with a power cord. Each speaker uses five watts of power, and the entire system comes with two 1.5-inch drivers. Despite the small size, these speakers offer a great frequency response, and they’re much more stylish than many alternative products. If you’re looking for a mix between modern and retro, then consider these computer speakers. The Genius Hi-Fi wood speakers produce rich, warm sound, and they’re powered by 14 watts of RMS power. Each speaker has a burnished black front, and the sides feature a beautiful wood color. For easy timbre adjustment, there is a convenient tone button, and the large power control allows you to quickly adjust the volume. The Genius Hi-Fi speaker system is powered by 14 watts and uses a pair of three-inch drivers to deliver high-quality sound. The Genius SW-G2.1 1250 offers some of the best computer speakers under $50, and with the built-in controls, you can adjust the bass and master volume levels. The subwoofer is made with an ultra-rigid MDF wooden cabinet, which delivers deep, rich bass, and the total output power for the entire system is 38 watts. You won’t find too many other speaker systems within this price range that offer the same amount of power. 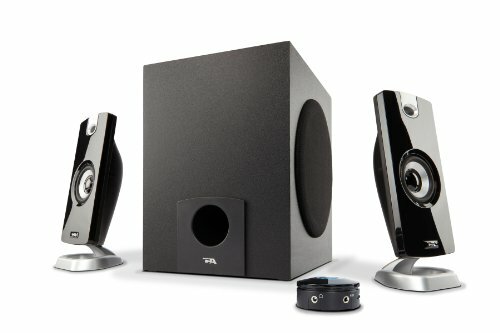 The Genius SW-G2.1 1250 four-piece speaker system comes with a control box, and to protect your computer components, the speakers are made with magnetic shielding.